A well-designed landing page can greatly increase conversions for your PPC or email marketing campaigns. Rather than directing visitors from those sources to your general website (where they may have a hard time finding what they are looking for), you can direct them to a specially-designed landing page that steers them in exactly the direction you want them to take. The Backpack home/landing page has a very clear call to action, though they opt to first direct visitors to more information about their plans and pricing, rather than going straight for the signup. Your copy should be clear and concise. It should be persuasive, too. Landing pages are not the place to show off your creativity unless that creativity is clear, concise, and persuasive. Leave the creative turns-of-phrase for your blog. It’s pretty safe to assume that most of the people who visit your landing page are already interested in what you have to say because they’ve likely clicked through from a PPC ad or email. But just because they’re interested when they arrive doesn’t mean they’ll stay interested if you don’t get to the point. Every single sentence and word on your landing page should serve a purpose, and that purpose should be to support your call to action. If it doesn’t do that, cut it. Be ruthless in editing your copy. Tell your visitors what they want to know in as few words as possible, and get them to respond to your call to action as quickly as possible. 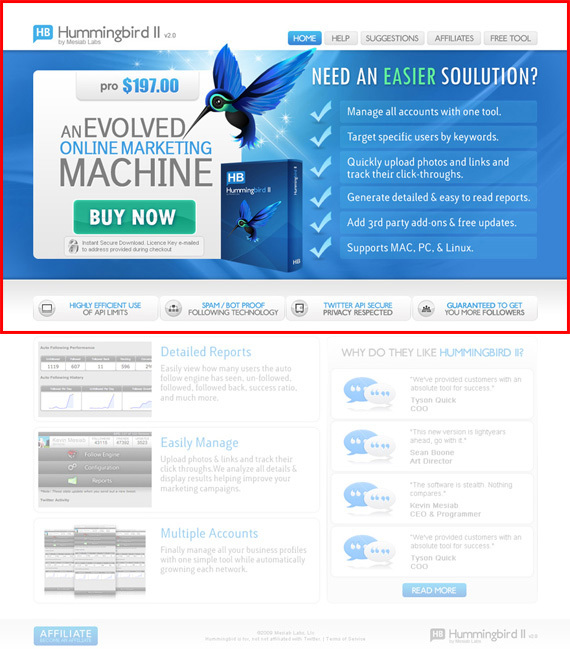 The VideoWizard landing page has a simple design with clear copy that has definite goals. If your landing page includes a form, make sure it’s only asking for the most vital information. If you’re trying to get visitors to sign up for an email newsletter, make sure you’re just asking them for their email address. Anything more than that decreases the chances that they’ll finish and submit the form. If you’re asking them to buy something, make it as easy as possible. Just ask for the vitals: billing and shipping information, plus a confirmation screen before placing their order. Keep it as simple and concise as possible. Wait to ask them for additional information until after their order has been placed. This form only asks for name and email address, neither of which is likely to deter sign-ups. This form, on the other hand, has too many fields. Do they really need a phone number and company name? And wouldn’t it make more sense to just ask for a name in one field, rather than two? The design of your page is just as important as the copy. A good design supports the call to action, while a bad design detracts from it. This is why, when it comes to landing pages, less is definitely more. The simpler your page and its design, the more likely it is to convert. The first major difference between your normal website and your landing pages is that your landing pages shouldn’t have your usual site navigation. Instead, the only clickable links should be your call to action, and possibly a link to more information for those who are undecided. Linking your logo to your regular home page can also be a good idea. This landing page shows just the vital links, without a ton of extraneous navigation. But forget about links to everything else. All they do is clutter up the page and increase the likelihood that your visitors will abandon your landing page (and ultimately, your site) without converting. Your landing page should still echo the design of your regular website, though, to reinforce your branding. This can be done through the graphics, general look and feel, or your color scheme and font choices. There’s some question out there about whether it’s better to use a single page for your landing page that requires scrolling, or if visitors respond better to a series of short pages (sometimes referred to as a “mini-site”). Compare this page, which barely fills a single screen, and uses multiple steps to gather information. While there’s a lot of debate as to the importance of “the fold” in web design, landing pages are one area where the fold is important. Make sure that your call to action is located near the top of the page, where someone can click it without having to scroll. This doesn’t necessarily mean that your visitors won’t scroll down the page to read more information. But hopefully, at least some percentage of your visitors will be ready to buy as soon as they arrive on your landing page, either because the email or link that brought them there already persuaded them, or because it’s not their first time visiting the page. Putting a call to action right near the top of the page just makes things easier for these visitors. The most important navigation elements are located just above the fold, with the call to action well above the fold. The signup button is well above the fold here, too. That doesn’t mean you should neglect those users who scroll. Make sure calls to action appear at regular intervals on your page, tied into the page’s copy. This becomes more and more important as your pages get longer. Make sure that your users have to do minimal scrolling once they decide to convert. FreshBooks includes links to a free trial or tour throughout their landing page. Your landing pages should use only one or, at most, two images. You want to avoid visual clutter on the page, or anything that detracts from the message and call to action. Larger font sizes are also a good idea, as the last thing you want to do is cause your visitors eye strain. Just don’t go overboard and put everything in a headline-size font. The ideal line length for copy readability is 39 characters, so size your font (and column width) accordingly. The typography becomes a major part of the visuals of this landing page, minimizing the need for graphics. Studies have shown that centered, single-column landing pages convert best. And yet, there are still plenty of marketers out there who are opting for two-column designs. Make sure that you test single-column versions of any landing page design against any two-column versions prior to committing to a design. A great example of a centered page that makes great use of the available space. If your landing page is tied to an email campaign, make sure that the landing page echoes the look and feel of the email. If the designs of the two are wildly different, your landing page visitors may wonder if they’ve ended up in the right place. The easiest way to do this is to carry over fonts, images, and colors from your email to your landing page. If you don’t want to have to use a web designer for your landing pages, there are options for creating great landing pages without any technical knowledge.Unbounce is one of the easiest to use, and lets you create landing pages without any IT experience. They have best-practices templates available that you can customize (or design your own page entirely from scratch), and flexible pricing (including a free plan for sites with limited traffic). Unbounce also integrates with Google Website Optimizer for testing, Google Analytics for tracking your traffic. Last but definitely not least, do not forget about making your landing pages understand-able for the majority of people. In most cases that means paying attention to accessible web design. If you enjoy your work, then others will enjoy it too!